Considered one of the most interesting buildings of the “Bolognese” Renaissance between the fifteenth and the sixteenth centuries, with its façade Casa Saraceni is an example of the encounter between the Bolognese tradition and the architectural novelties from Florence. Its rich terracotta decoration stands out alternating with the sandstone of the portico capitals. Antonio Saraceni’s residence in early sixteenth-century, its famous guests include two Veneto Ambassadors among Pope Julius II’s suite. In 1930, it was purchased by Cassa di Risparmio di Bologna, restored and refurnished in neo-Renaissance style. The grand staircase was decorated with grotesques by Roberto Franzoni, author also of the allegorical panels in the ceremonial hall of the main floor. The halls contain Bolognese seventeenth-century and eighteenth-century paintings belonging to the Foundation art and history collections. Among them, the series of finely framed eighteenth-century tempera paintings by the landscape painter Vincenzo Martinelli and the figure painter Nicola Bertuzzi stand out, which were once contained in the villa La Sampiera on the Bolognese hills. 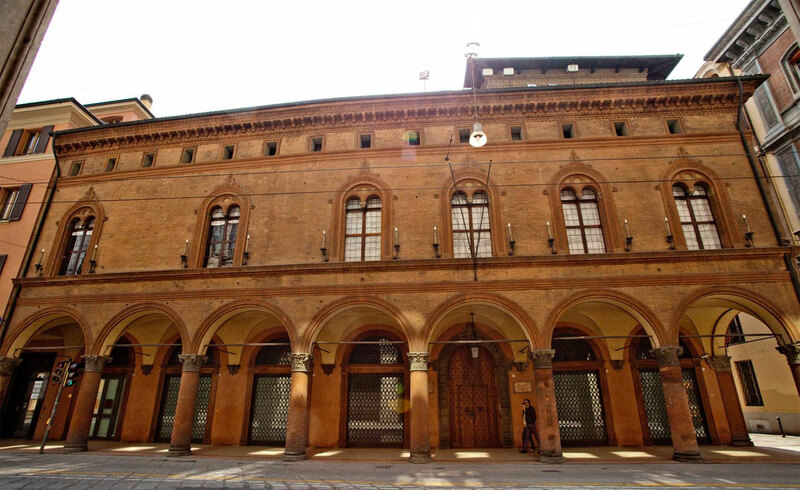 More recently, the building became the seat of the Fondazione Cassa di Risparmio in Bologna, which promoted a wide and complex restoration. Today, it is open to the public on the occasion of art exhibitions and cultural events on the ground floor.